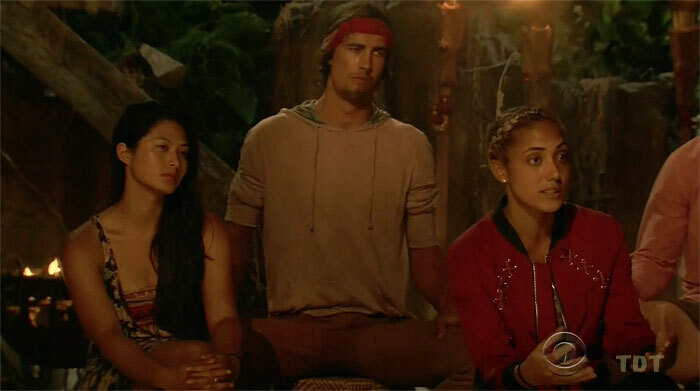 Survivor: Heroes v Healers v Hustlers (2017) - 17th place, 2nd out. Voted out in Episode 2, "I'm a Wild Banshee" (Day 6). Heroes v Healers v Hustlers Ep. 2 RC/IC: "Crossroads" - Blows a huge lead on the puzzle; Hustlers lose (3rd/3). Heroes v Healers v Hustlers, Ep. 2: Five votes, from Ali, Devon, Lauren, Patrick, and Ryan (voted out, 5-1). Josh Wigler at The Hollywood Reporter (9/22/17): "Player Profile: Meet Simone Nguyen"
Josh Wigler at The Hollywood Reporter (10/5/17): "How the Second One Out Faced an Ocean of Nightmares"
Dalton Ross at EW.com (10/5/17): "Simone says Ali and Patrick knew each other before the game"
Gordon Holmes at XfinityTV.com (10/5/17): "Simone - 'I Thought that Ryan Was the Biggest Threat'"
Mike Bloom at Parade.com (10/5/17): "Simone Nguyen Gets Dumped By Her Tribe"
Rob Cesternino at RHAP (10/5/17): "Exit Interview #2: Second Boot from Heroes v. Healers v. Hustlers"
"Hobbies: Volunteering, yoga, and complaining. What's your personal claim to fame? I don't really have one, but I'm proud of the fact that I earned full rides to Columbia, Harvard, and Tufts. Who or what is your inspiration in life? My mentor and friend Susan Shin, a successful businesswoman and attorney in NYC. You would never know the struggles or experiences she has had in life by looking at her. Not only is she one of the most talented people that you could meet, she is also one of the kindest. If you could have three things on the island, what would they be and why? I would bring a journal, my red Vietnamese blanket, and Chapstick. Which Survivor contestant are you most like? Tai from Kaoh Rong, because I'm like bamboo in the wind, and Michaela from Millennials vs. Gen-X, because I enjoy judging everyone. What's your reason for being on Survivor? I wanted a change... for like a month."